An incredible 550bhp bi-turbo V8 E63 AMG with just 24,000 miles & full Mercedes service history. 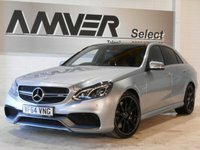 Diamond silver metallic with black Nappa leather trim, equipped with harman/kardon Logic7 sound system, electric panoramic glass roof, satellite navigation, reversing camera, electric heated seats with dual memory, keyless entry & ignition, Linguatronic voice commands, Mercedes Apps system, 19" alloy wheels & more. A true super saloon with 3-stage adjustable suspension, drive program selector with Sport, Sport+, Comfort & Manual modes, Race Start launch control, steering wheel paddles and a phenomenal deep V8-powered soundtrack through the AMG quad-exhaust. Supplied with complete book pack in Mercedes wallet, two keys & full Mercedes main dealer service history. This car comes with six months Momentum Platinum Plus warranty so that you can drive away with total confidence knowing that you are benefiting from what is probably the best warranty cover available in the UK today.